Our favourite meal is brunch, so we decided to have a “brunch themed” wedding, which began at 11:30 am, with brunch cocktails and hors d’oeuvres, and ended by 5 pm. (Who doesn’t love eating and schmoozing for hours with friends?) 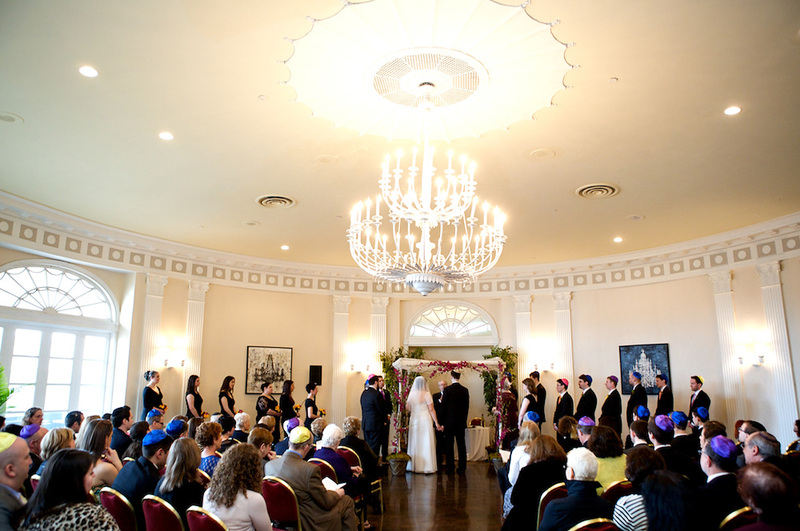 We also had a pretty traditional Jewish wedding (grooms tisch, badeken ceremony, etc. ), and Alex just finished converting to Judaism in the summer of 2012. 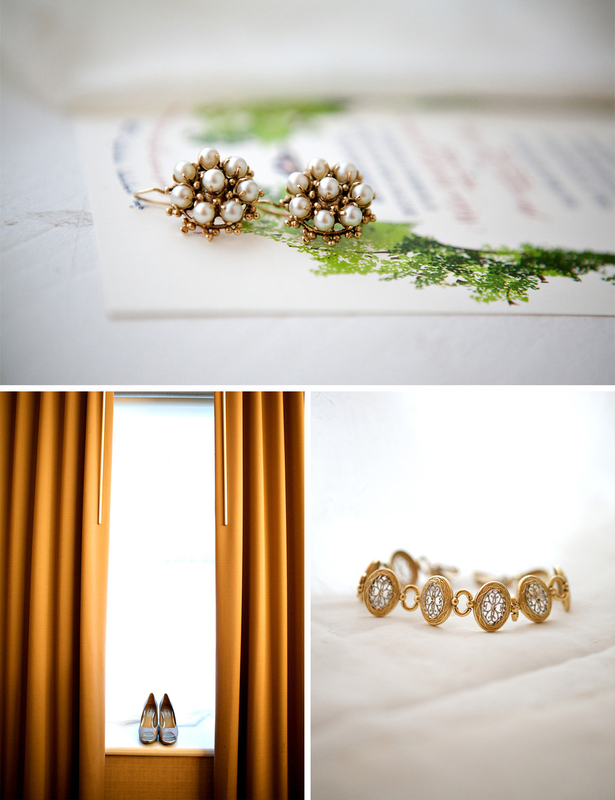 I have been to too many “typical” Jewish weddings, and Alex and I wanted a lot of unique and personalised details. We love to cook together, particularly with fresh herbs, so there were potted herb plants in a box (that my stepfather made) on the table with the potted gerber daisies. There were a couple of factors in play when we were thinking about locations. 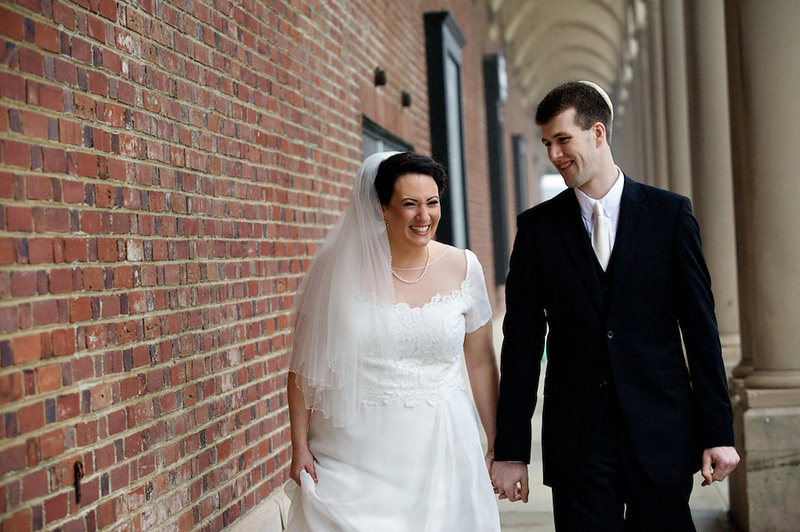 Firstly, Alex and I live in Washington, D.C., and we were initially looking for locations in the D.C. Metro area. 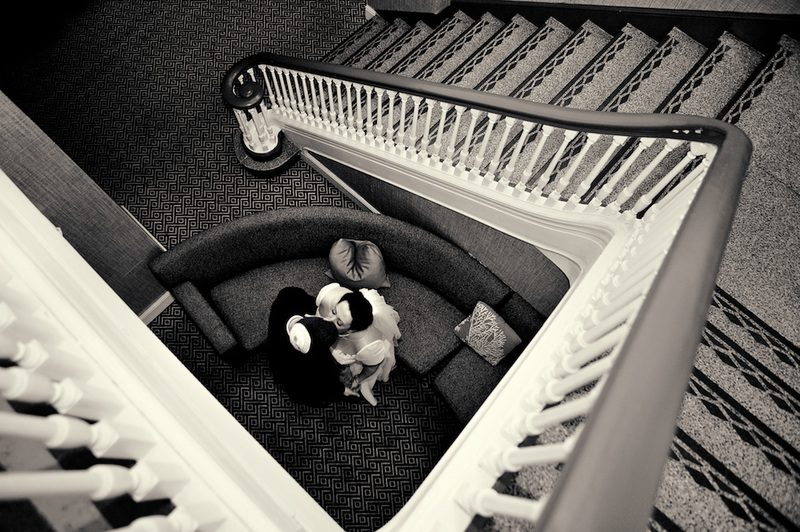 Secondly, we both love older architecture, and we knew we were not looking for a standard venue. 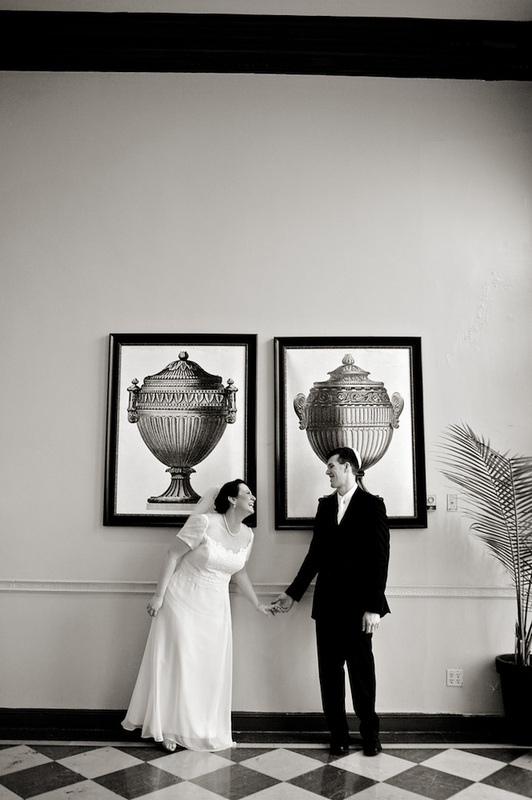 We wanted something a little different that reflected the dynamic of our relationship — classy and timeless. 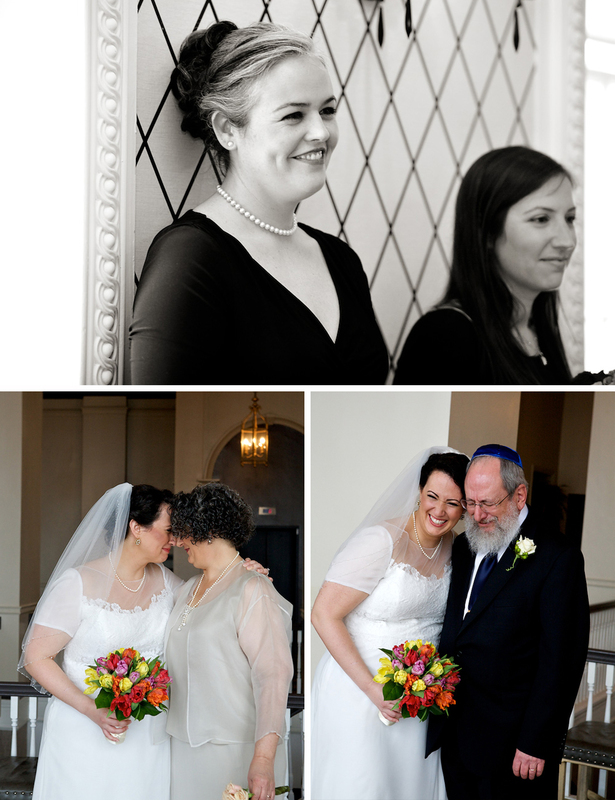 Thirdly, we were committed to being married by our fabulous rabbi with whom Alex studied during his recent conversion. We then came across some challenges as we were searching for venues. 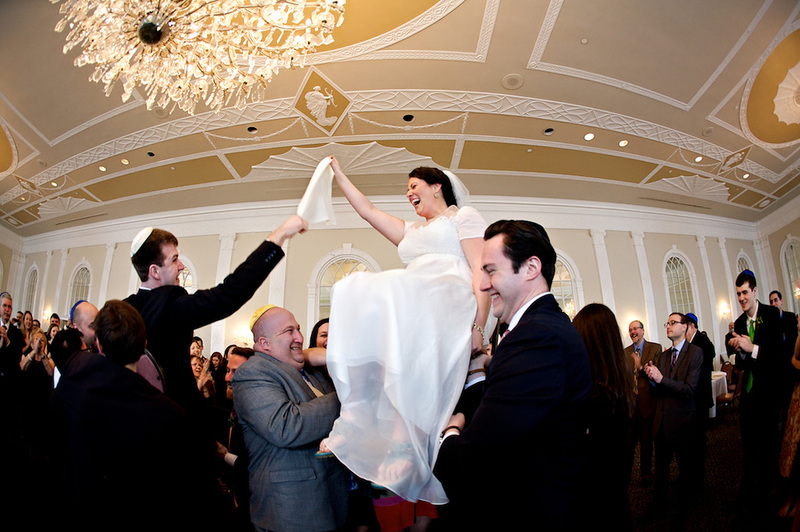 My family is relatively observant, and looking for a venue in D.C. that was Shabbat-friendly and had access to kosher food became a little a little difficult to find. 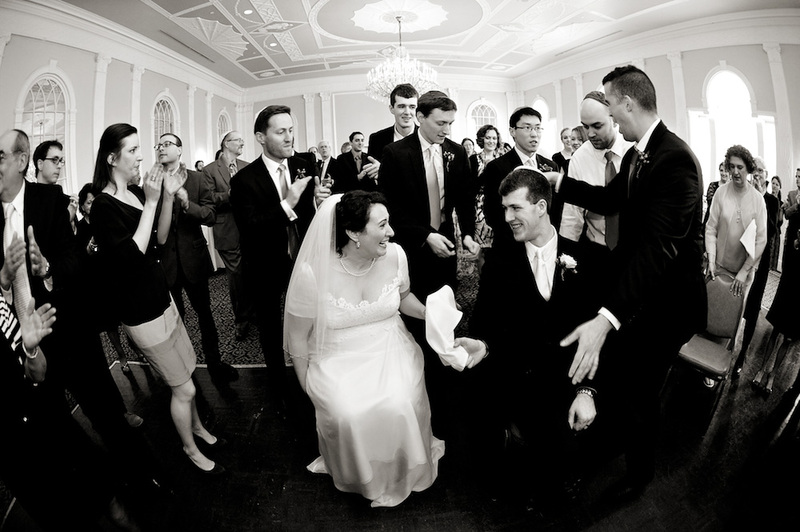 Finally, my brilliant mother said, “What about the Berkeley Carteret?” I immediately remembered the magnificently beautiful ballrooms from an event I attended there years earlier and said that I would discuss it with Alex. Alex and I took a trip up to New Jersey to visit the beautifully renovated 1920s hotel on the Asbury Park boardwalk, recently rebranded as the Berkeley Oceanfront Hotel. As we were driving up to the hotel, I remember having a really good feeling as we passed the beach and the quintessential 1920s Jersey Shore buildings. As Alex and I toured the hotel, the ballrooms were as spectacular as I remembered them, and the entire hotel had a charming feel. Alex completely agreed with me, and we decided it was the place for us! The only question looming over us was if our rabbi would be able to make it up to New Jersey for the wedding, and he thankfully said yes. OUR COLOUR SCHEME WAS NO COLOUR SCHEME AT ALL! Finding a theme and colour scheme was a fun project! I wanted to find something that reflected the two of us. 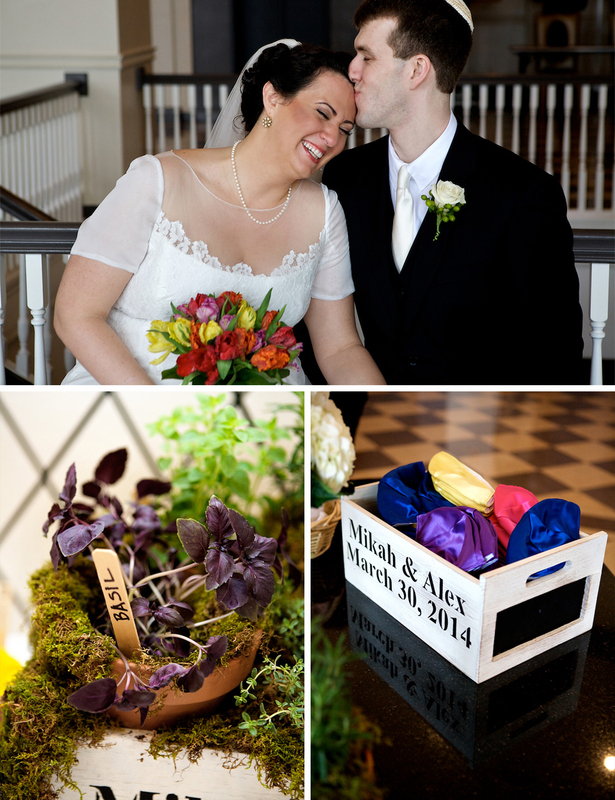 Once we had our early Spring wedding date established, two things came to mind: brunch and gardens! Alex and I love exploring and trying new foods, restaurants, or just cooking things ourselves. We particularly love making, or going out for, weekend brunch. We figured, why not substitute a hearty, relaxed brunch in place of the more conventional (and stiff) dinner reception? Our cocktail hour began at 11:30 with mimosas, bloody mary’s, and belinis, and all the brunch hors d’oeuvres we could think of! The brunch itself had an omelet station, a wok station, a fish carving station, a salad station, and many, many desserts. 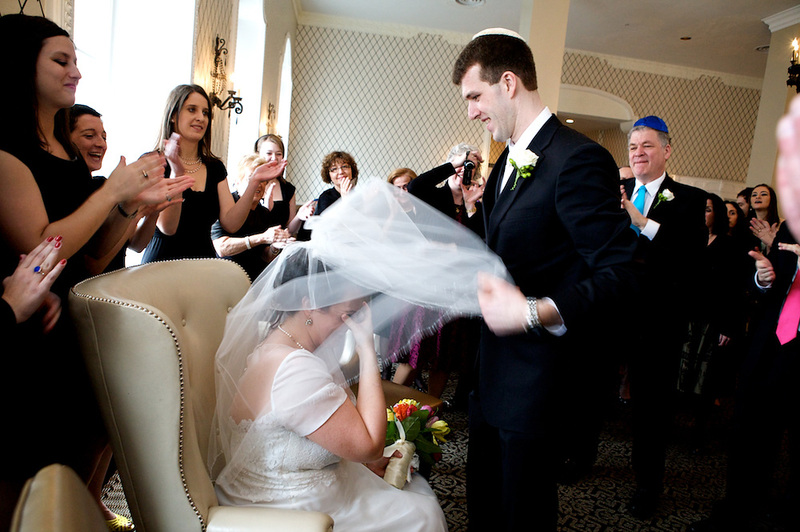 No one left hungry — it was a Jewish wedding, after all! I have a thing for magnificent colourful and wild gardens. I knew that the colour scheme I wanted was not having a colour scheme at all. 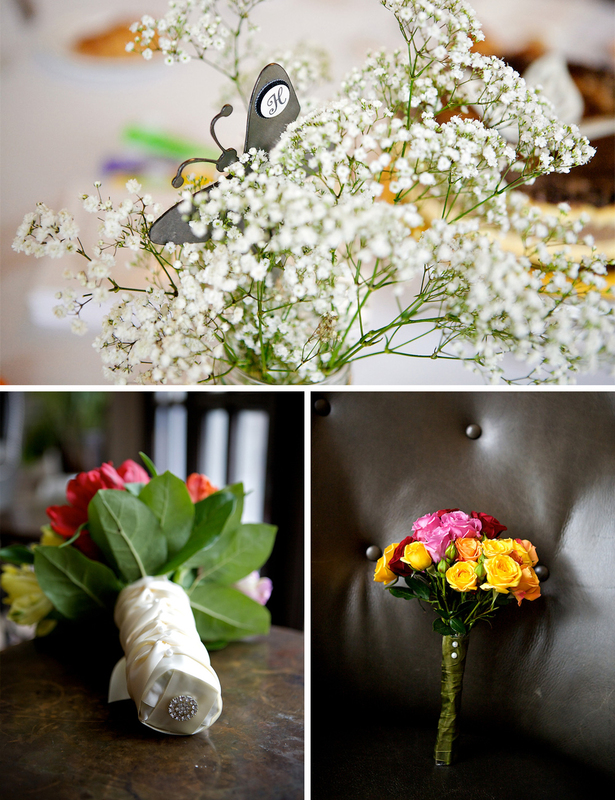 When I walked into Peter James Floral Couture, our florist, Peter asked me what I was thinking about in terms of colours. I told him that, “I wanted all the colours.” I wanted a magnificent garden full of different coloured tulips, roses, daisies, and orchids. Peter understood my vision immediately, and it was fun to brainstorm ideas of how we were going to incorporate all the flowers I love. Of the flowers I mentioned, Peter asked me what my favourite was, and I said tulips. (I love tulips!) 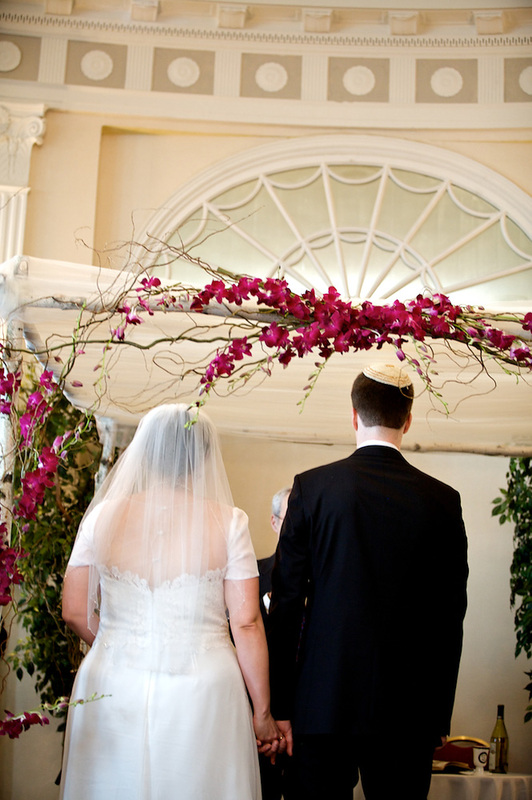 He created the most magnificent bridal bouquet of multicoloured parrot tulips, my bridesmaid’s bouquets were multicoloured roses, and our chuppah was covered in purple orchids. 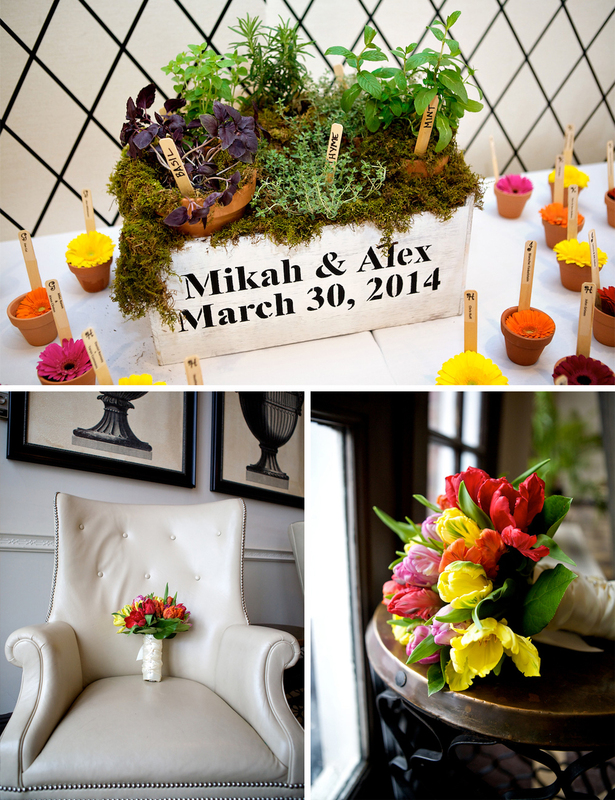 Our guests were involved, too; in lieu of a place card, they each picked up a tiny clay flowerpot with different coloured gerber daises with their table assignment. 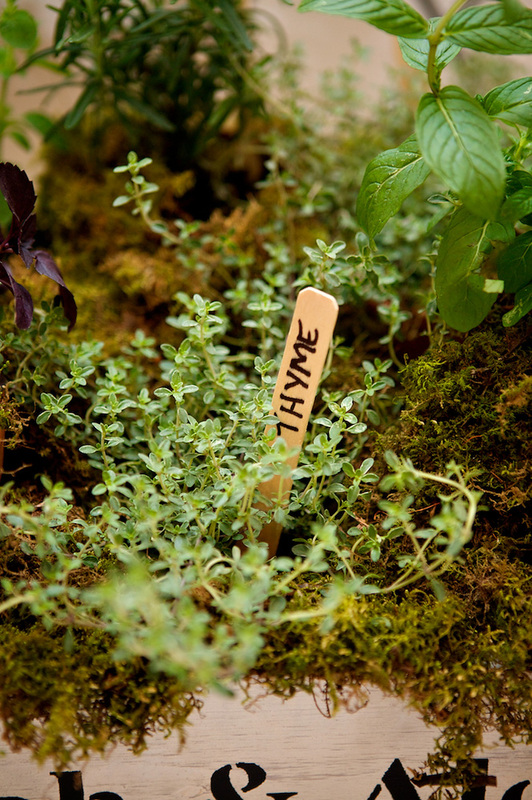 I was looking for a centrepiece for the table with the clay pots, and a friend of mine sent me a link to a box of herbs. I thought it was a perfect idea because Alex and I love using fresh herbs in our cooking. My mum and stepfather were incredible throughout this whole brainstorming process because anything I found on Pinterest that I loved, they somehow figured out how to make, including the herb box stencilled with our name and wedding date. I also wanted fun centrepieces to match the rustic garden theme, so my mum and I made vases out of mason jars, burlap, lace, and pearls. It was quite a fun arts & crafts project! No mason jar looked the same. 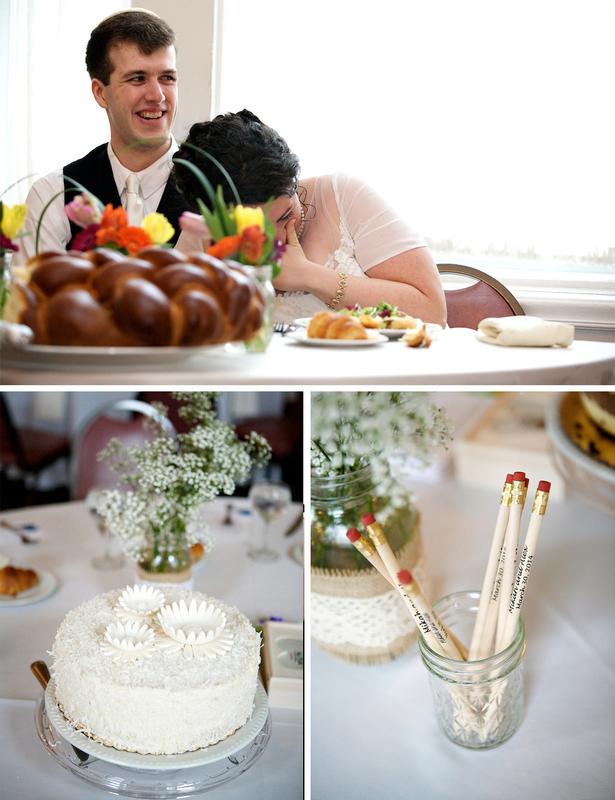 At the wedding, Peter filled the mason jars with baby’s breath, and my mum found some adorable butterfly garden markers to put into the mason jars, which we used to indicate table assignments to coordinate with the clay pots. 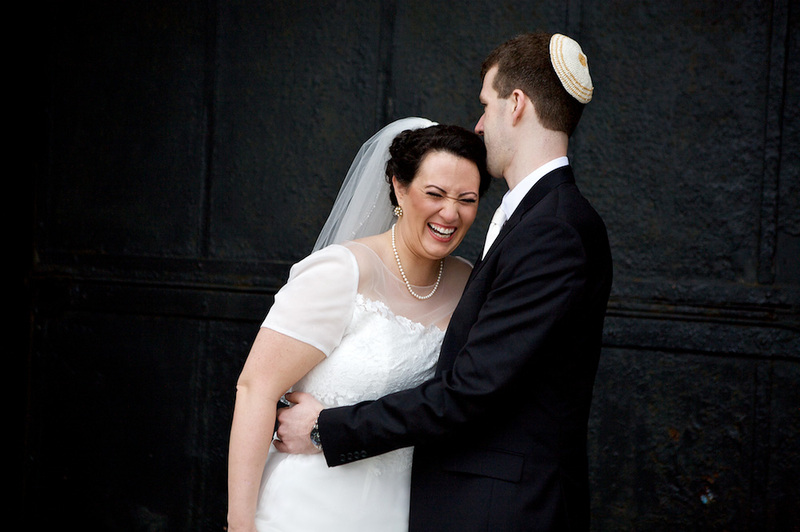 While perusing the Internet looking for Jewish wedding invitations, I came across an amazing vendor on Etsy, Itcoa. 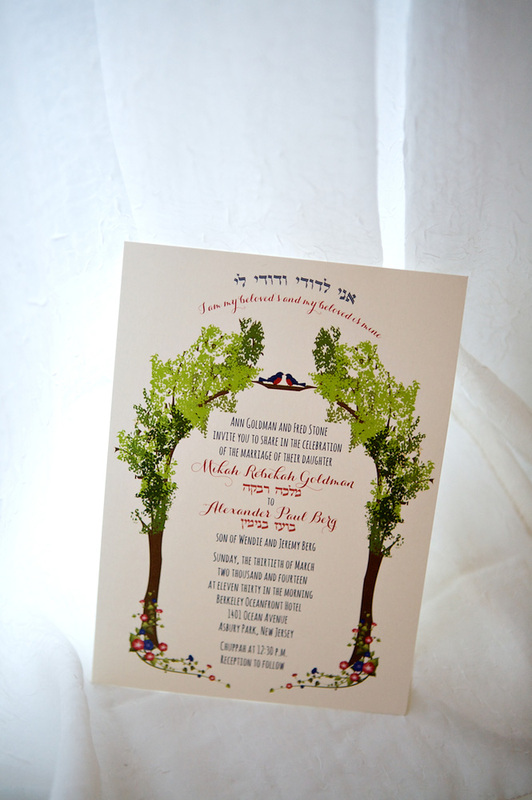 I saw a template of an invitation with flowers, trees, blue and red lovebirds, and decided to reach out to the artist. Judy was amazing to work with! 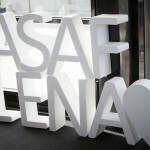 She actually creates her own fonts — she’s incredibly talented and created an invitation that was perfect for us! 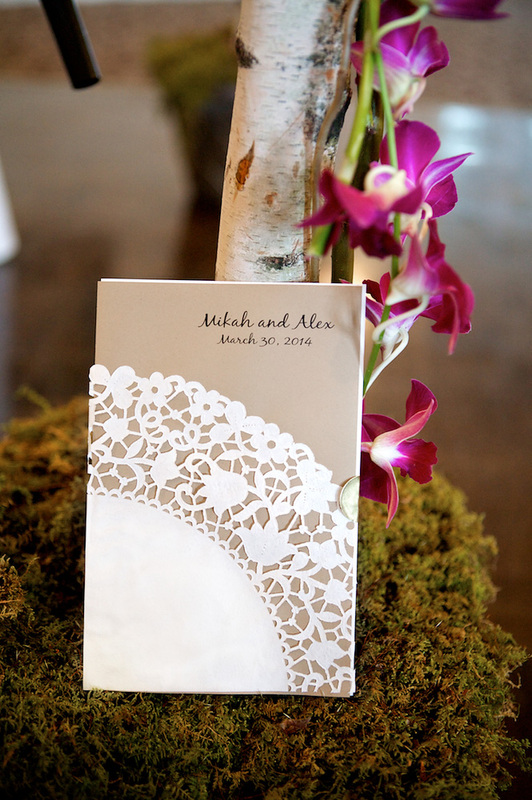 We received so many lovely compliments on our invitations. 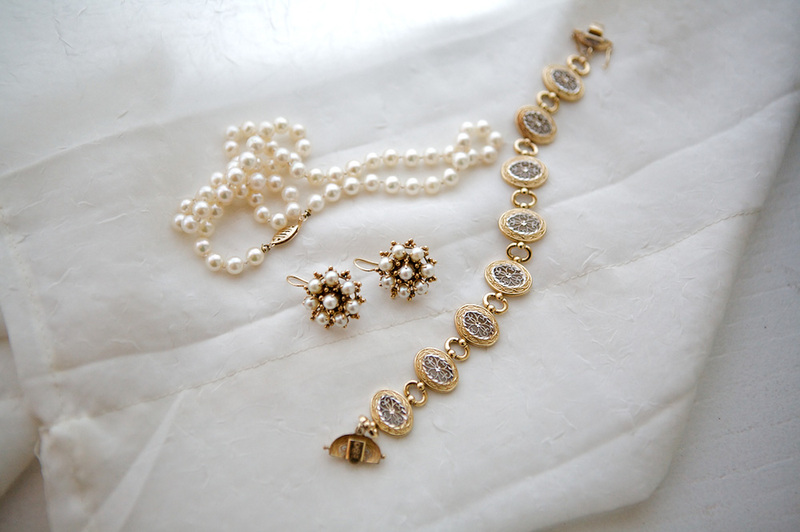 My jewellery was multigenerational, which was really special. 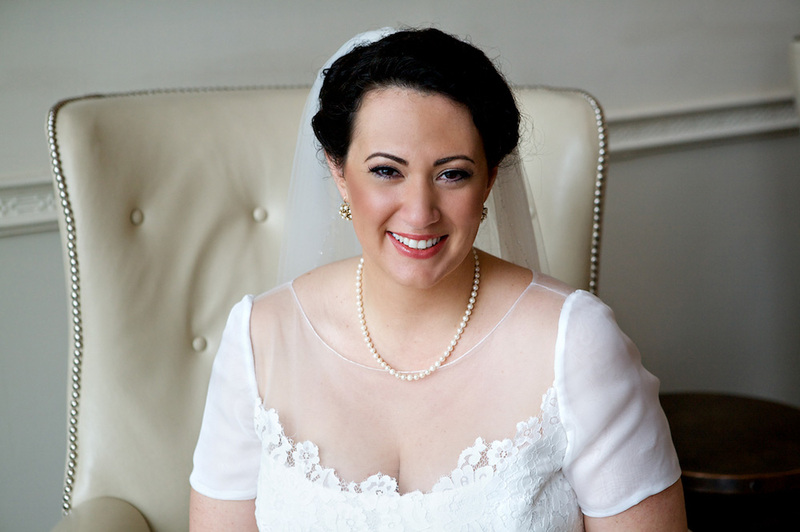 I was wearing my mother’s bracelet, my grandmother’s pearl necklace, and my late great grandmother’s pearl earrings. They all meant a lot to me, and the jewellery was the perfect symbol for me to know that my family was all with me on our special day. I probably ended up with five extra pairs of shoes from all the shoe shopping leading up to the wedding! 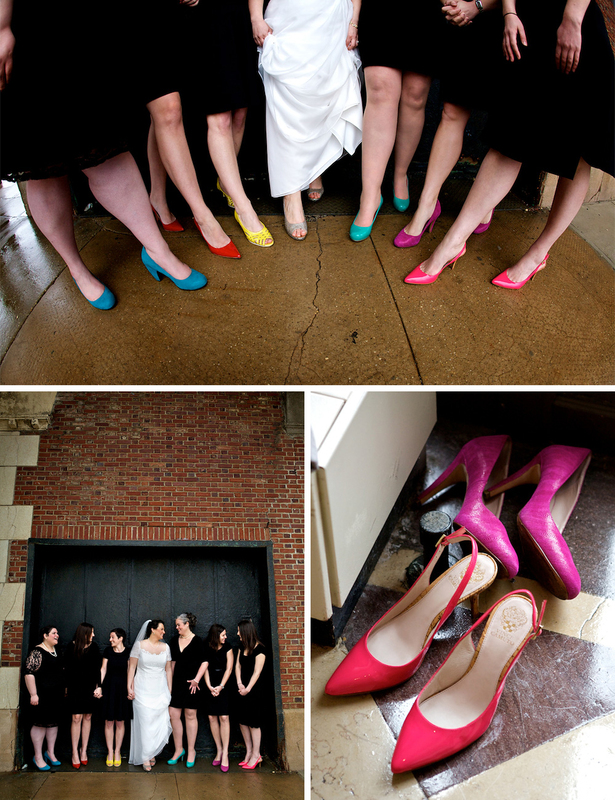 I initially was set on buying a coloured pair of flats, which just did not look right with the dress. Then I tried all sorts of coloured heels, which did not look right either. I ended up with an open-toed, jewel-toned Bandolini pump. While the shoes were lovely, I quickly switched out of them following the ceremony into a pair of sandals. Before I moved to Washington, D.C., I was a customer (and I like to think friend) of Amy and Kelly, the owners of Sorelle Salon & Spa in Lake Como, NJ. 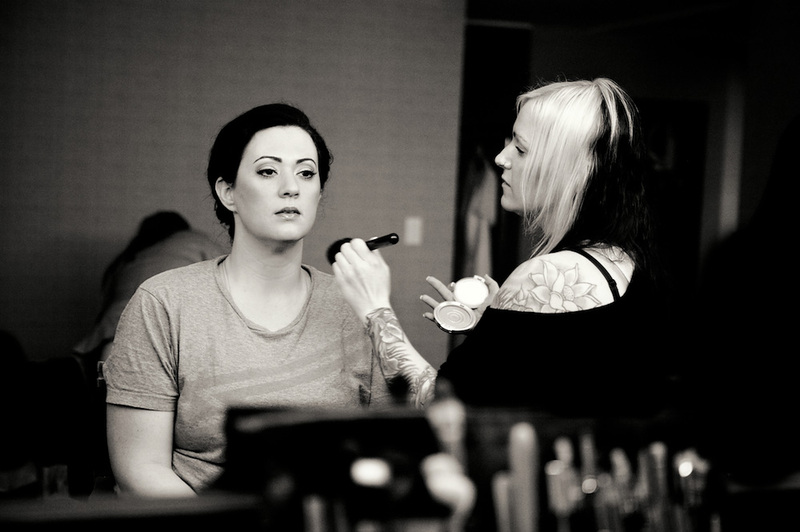 Amy is an amazing hairstylist, and Kelly is the best makeup artist and aesthetician. They are best friends and sisters, and they go above and beyond to make everyone feel completely comfortable and at home in their salon. 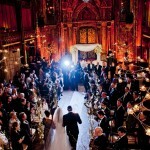 When I knew my wedding was going to be in NJ, I called them to make sure I had them booked! It was incredibly sweet that even after five years of not seeing them, their receptionist knew who I was and they accommodated everything that I needed. Unfortunately, Amy was unable to do my hair the day of the wedding, but their associate Dawn did a phenomenal job. Dawn asked me what type of hair I wanted on my wedding day, and I pulled out fifteen different pictures on Pinterest on my phone, and she topped them all. 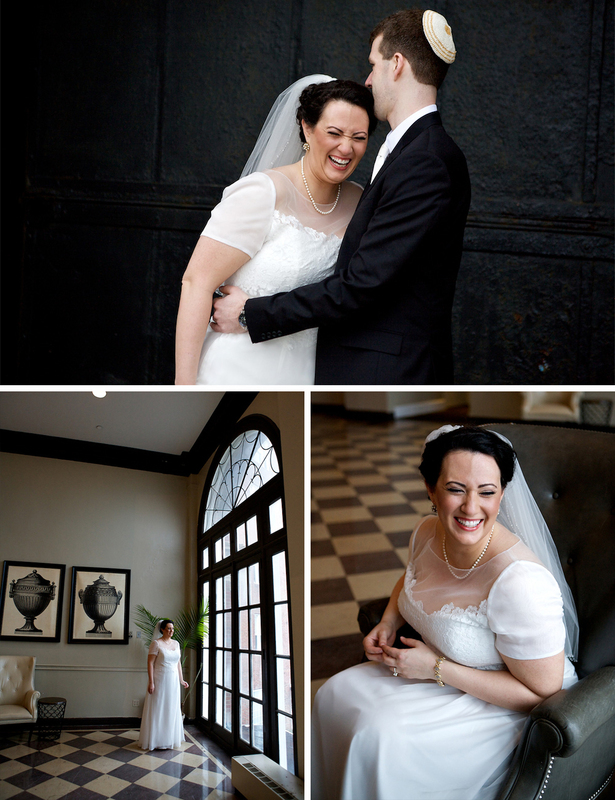 Our wedding photos started at 7 am, so Dawn and Kelly came the wedding venue at 5:30 am to do my hair and makeup. Love those women! Alex picked out his own suit! I was unsure of what to expect, and he looked so incredibly handsome. He ended up wearing a three-piece Jones New York black suit with an ivory tie and an ivory kippah my mum made him. 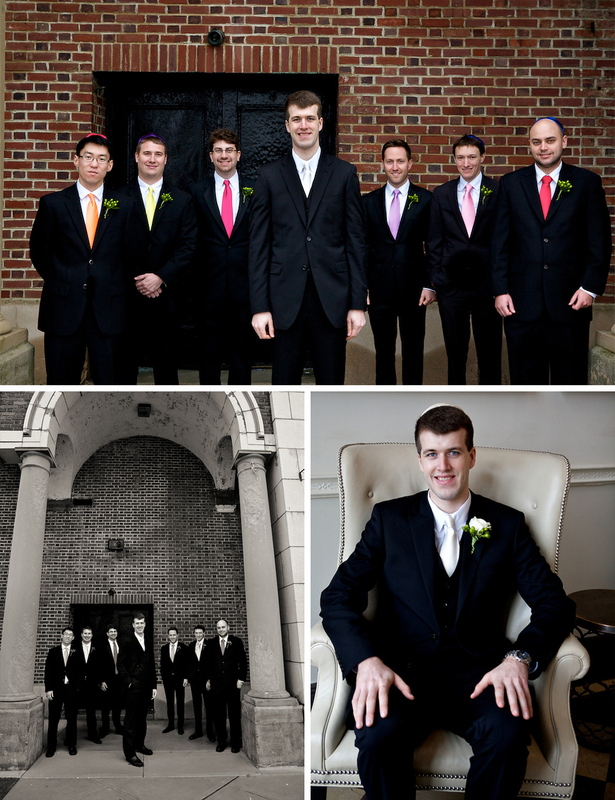 Alex gave all his groomsmen a different coloured tie to wear to tie into our multicolored theme, and I love how Alex pops out in the pictures with his groomsmen. 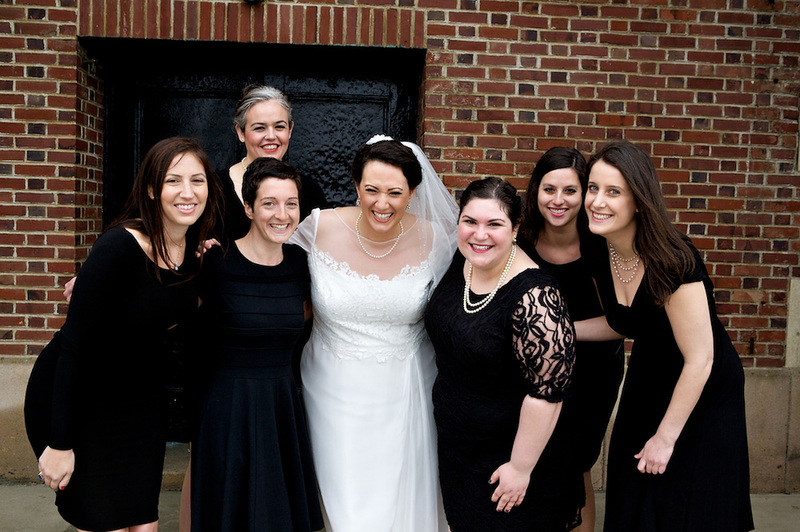 I had six bridesmaids that flew from into New Jersey from all over the country, and internationally, to be with me on my wedding weekend. I have the best girl friends in the world. The fact that they all came from all over really meant so much to me, and I really tried to be a low maintenance bride. (Some of my bridesmaids would tell you I was more successful at that than others!) I told them all to pick a “little black dress” that was knee-length dress and covered their shoulders, but left the rest up to each of them. 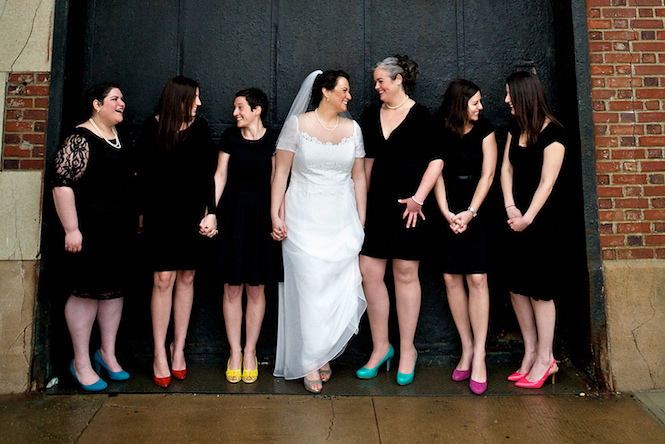 I also requested they all wear brightly coloured shoes that would tie back in with the multicoloured, pastoral theme. I thought their shoes looked hot! I loved how comfortable everyone looked because they had the opportunity to pick a dress they loved, and I thought they looked fabulous in their dresses with the multicoloured shoes and rose bouquets! 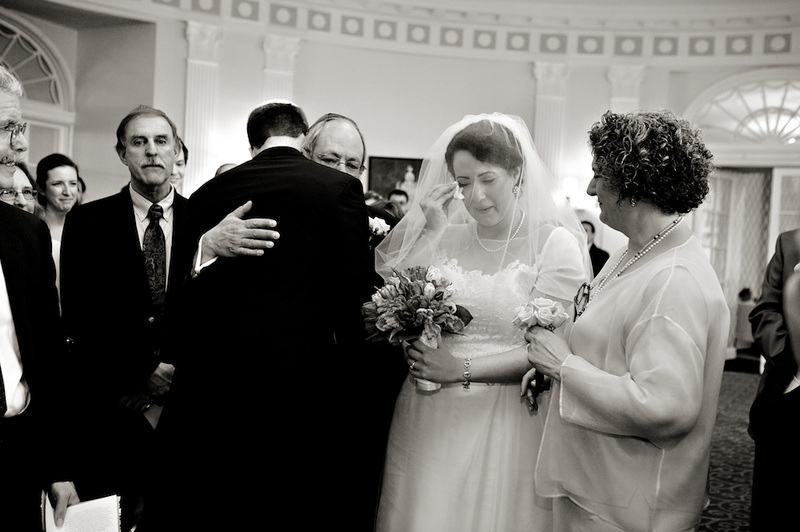 As I mentioned, Alex converted, and we wanted to make all guests and family feel at ease and comfortable. Alex and I wrote an in depth wedding program explaining Jewish wedding customs and traditions that my mum and I made into a cute pamphlet with a beige cover with a doily that was handed to guests before the chuppah ceremony. Alex and I walked into an instrumental version of a Garfunkel and Oates song we love. It was the first YouTube video I ever sent Alex, and we thought it was an appropriate occasion, even though probably not more than the two of us “got” the joke. It leant some sentimental lightheartedness to get our special day off to a personal, smiling start. 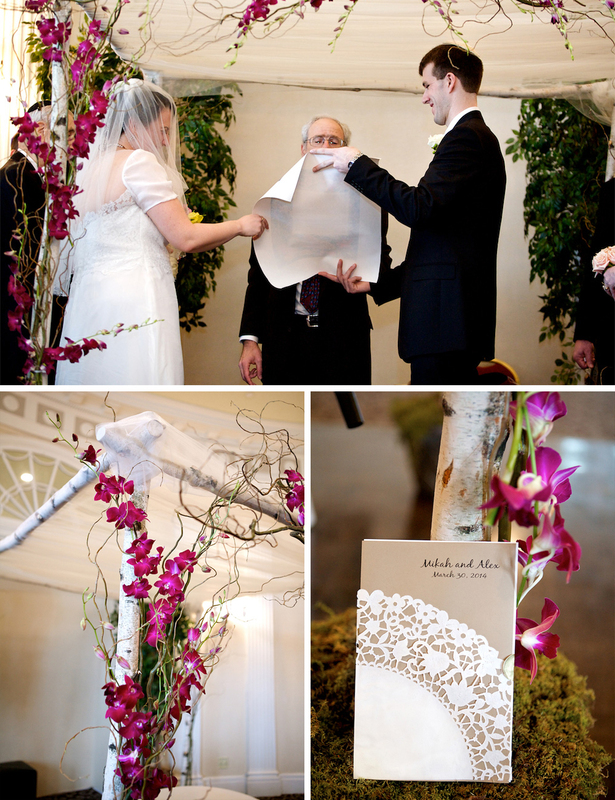 We used Peter James Floral Couture and they were so fabulous! I cannot say enough good things about Peter and his team. Everyone commented on my beautiful bouquet, my bridesmaid’s bouquets, and our creative table seating idea and flowers. Alex’s groomsmen had green coffee bean boutonnieres that added floral brightness and tied in with our brunch theme. Alex and I were looking for photographers with a photojournalistic style. We wanted the type of photographer that would not be intrusive and get some fabulous shots of our wedding guests (and us) without looking too posed. 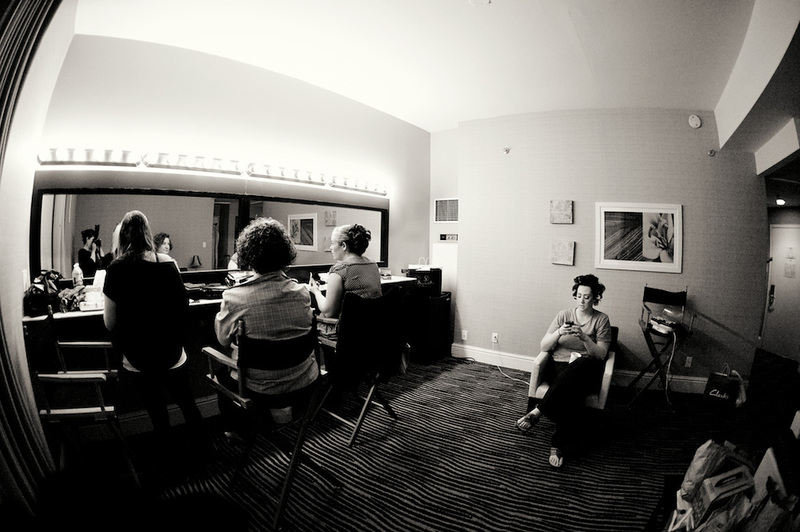 I knew when I came across Adia Photography’s website that Amy was the one. I must have looked through almost every wedding on her blog. I love how Amy immediately had this amazing sense of each couple, and she captures their style and their day. No two weddings, on her site, look alike. One of the reasons we picked the Berkeley Oceanfront Hotel is that it is right on the Asbury Park beach and boardwalk, and there are so many great places to capture fantastic photographs. It was a bit grey and overcast on the morning of our wedding, and I was majorly disappointed that we couldn’t go out on the beach and boardwalk. Amy came prepared with a huge umbrella and rallied us to go to a few places just outside the hotel where we could duck under if began to pour! 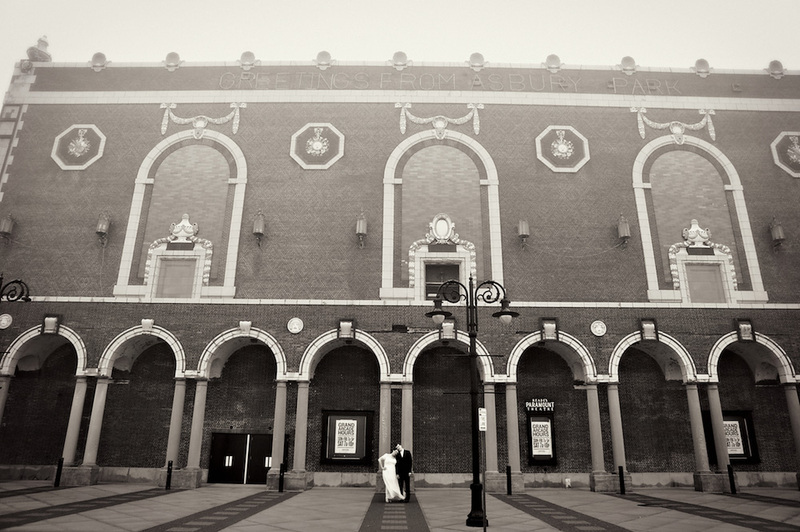 She really managed to get some great pictures of us outside the Asbury Park Convention Center and a few other places. Amy posted a “sneak peek” of our wedding photographs two weeks after our wedding, and the photos were more than we ever imagined! 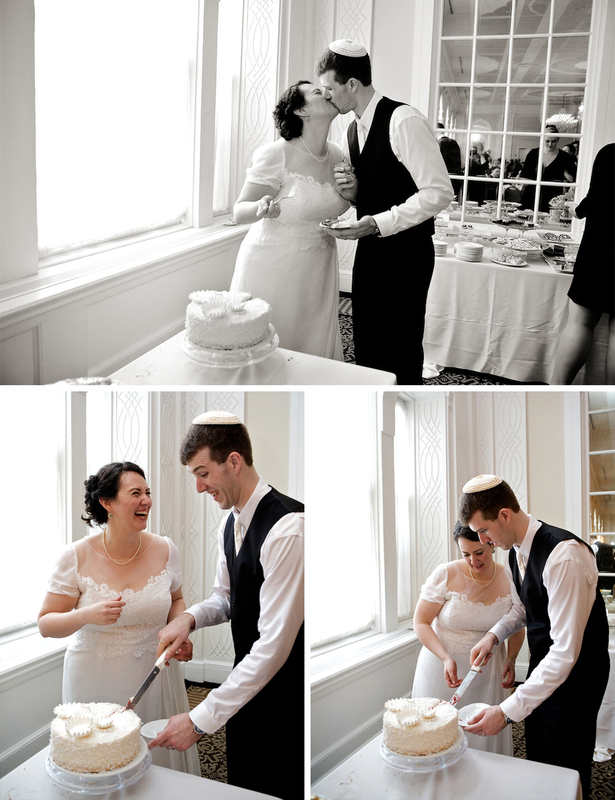 We decided to go with a kosher dairy wedding almost exclusively for dessert. (Alex and I both love (and laugh about our love of) cheesecake, so we “worked our way backwards” from that decision to come up with an appropriate dairy meal for the day.) To complement the unique mason jar centrepieces that my mum, our florist, and I put together, we decided that it would be fun and beautiful to feature a different cake on each table as the main centrepiece instead of the typical single, tiered wedding cake. We had 14 (!) different gorgeous cakes, ranging from Oreo cheesecake, to lemon raspberry cake, to a triple chocolate cake. All the cakes were taken from the centre of the tables and made into a dessert bar, and we even managed to take home some leftovers. 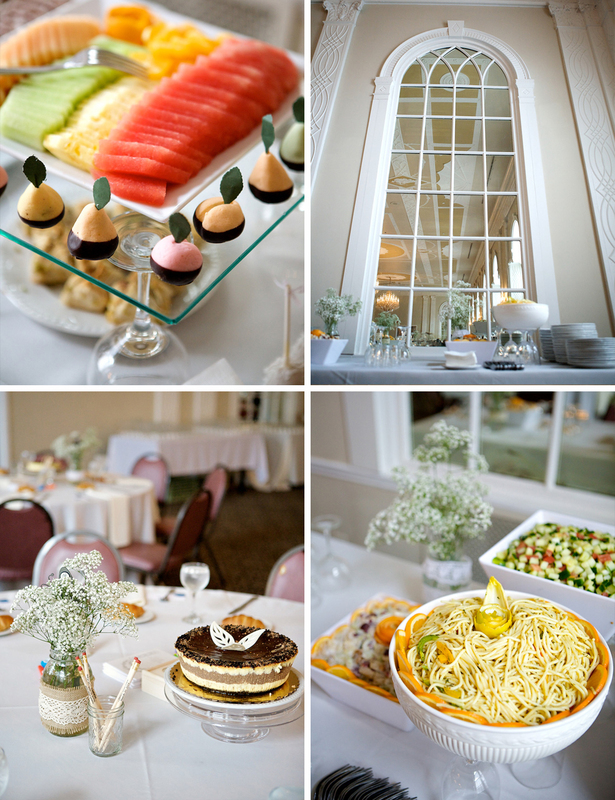 Our caterer was fabulous and we cannot recommend them enough! 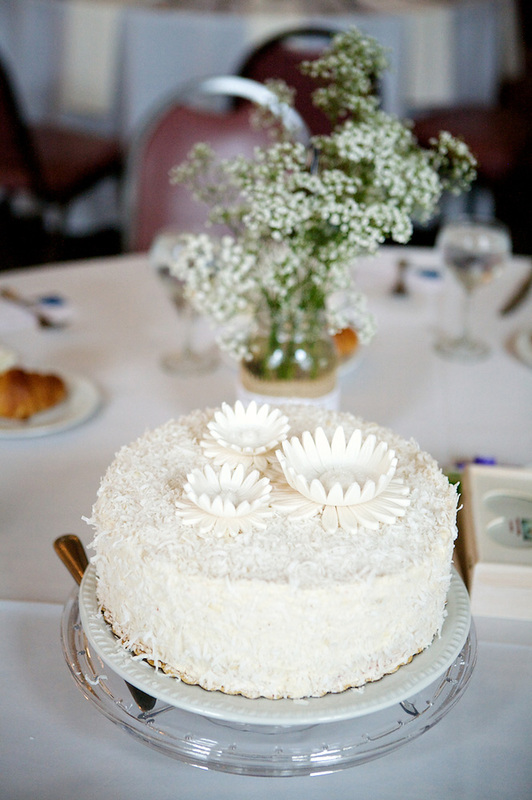 We came to Greenwald Catering with the brunch and cake idea, and they ran with it. Aside from hors d’oeuvres, we had croissants, an omelet station, a fish carving station, a wok station, a station full of different salads, and so much more! The menu was insanely delicious. 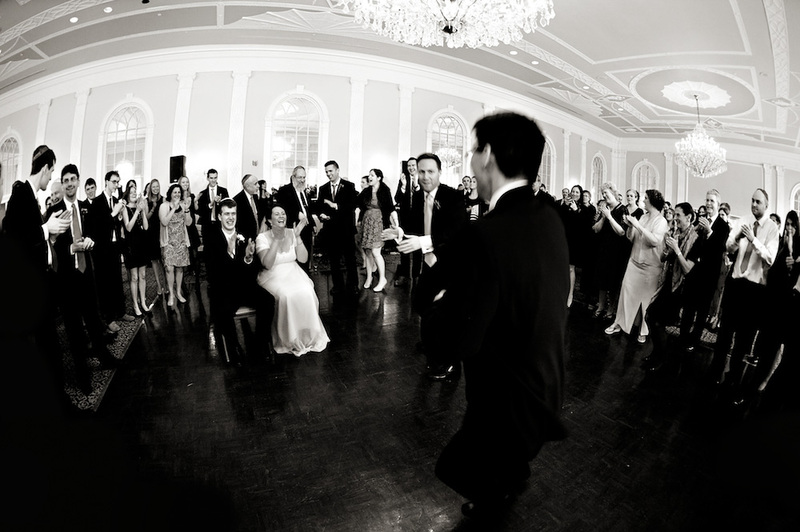 Alex and I wanted a band that could handle everything from an energetic hora and Israeli folk dancing, to our sentimental first dance (Otis Redding, “These Arms of Mine”), to pop and classic rock tunes. We owe full credit to my parents for finding Avi Maza Orchestra. They were tremendous. 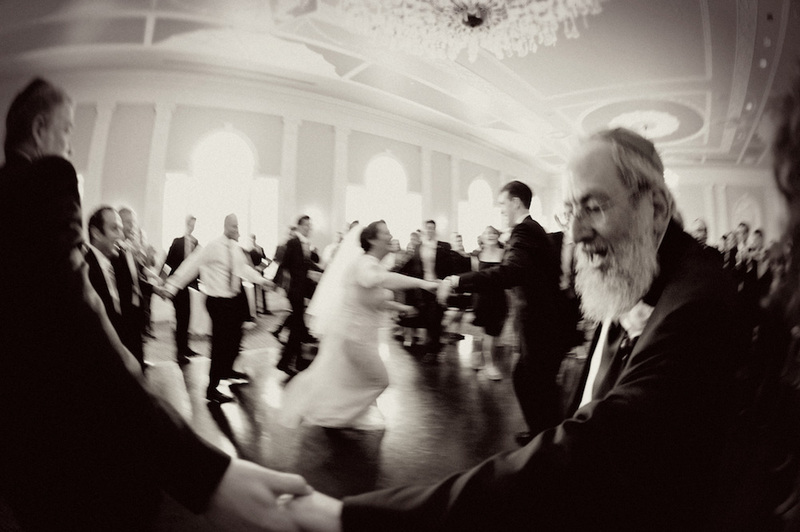 We were super fortunate in that our rabbi, who converted Alex, came up to New Jersey from Washington, D.C. One of the most memorable moments from the wedding was during the hora, when Rabbi Seidel got into the middle of the circle and started juggling bowling pins. Everyone is still talking about our multi-talented juggling rabbi! 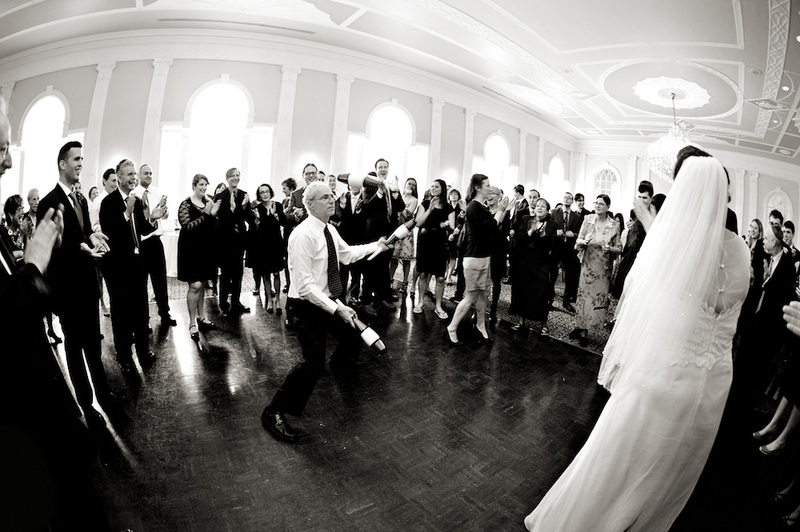 The aforementioned Garfunkel and Oates song that I walked down the isle to has some kazoo playing in it. Though I am very fond of many different types of music, I am not musically inclined, and I joked with Alex that maybe I should learn how to play the kazoo. On our third date, Alex bought me a kazoo. 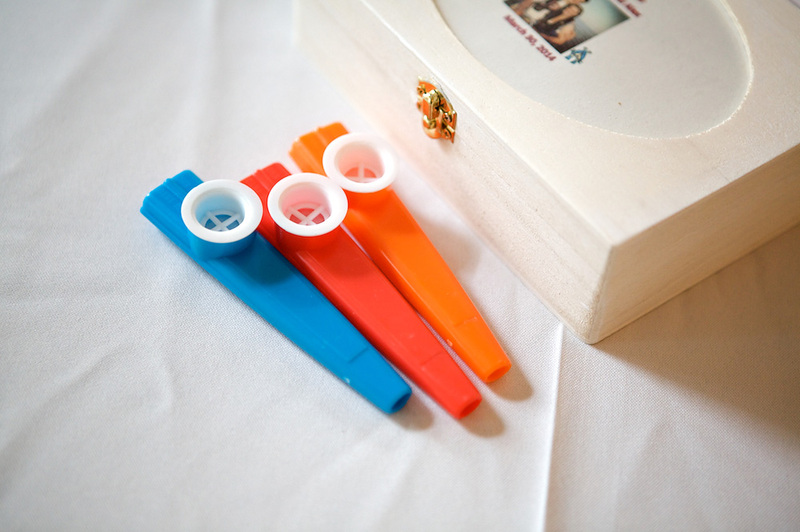 We thought putting colorful kazoos out on the tables for people to play and take home was a cute idea. Alex and I also helped my parents assemble hospitality bags for our out-of-town guests that featured some standard fare (a list of directions and local places of interest for pre-wedding day trips, bottled water, etc. ), with our personal touch: a cornucopia of my mother’s freshly baked treats, including rugalach, sesame cookies, lemon bars, and dipped macaroons, served in plastic “strawberry pint” crates. Many of the recipes appear on her own fun blog, aptly called Bread & Babka. Many of our guests came up to us toward the end of the reception to compliment her baking as much as anything else during our amazing wedding weekend! In lieu of a guestbook, I found another great idea on Pinterest: personalised advice cards. Each table seating had an advice card to Mikah and Alex, along with a box to put them in, and another party favour, which was a personalised pencil with Alex’s and my name on it along with the date of our wedding. We read them all on the way from New Jersey back to Washington, D.C. and we simultaneously laughed hysterically and cried for about an hour of the ride while each card was read. One of our favourite advice cards was from our rabbi, which said, “Alex: you make all the major decisions. Mikah: you decide which decisions are major.” Alex and I plan to make a scrapbook out of the advice cards. I think the biggest thing to remember is that all wedding planning is stressful — you’re not alone and you will get through it. You should always make sure that you and your spouse are a team, and you’re going to be a team for life! The wedding is just one day that launches you two into your lives together — make it something that reflects the two of you. After all, almost everyone at your wedding has been to a wedding before; nobody has ever been to your wedding before, so make it unique! 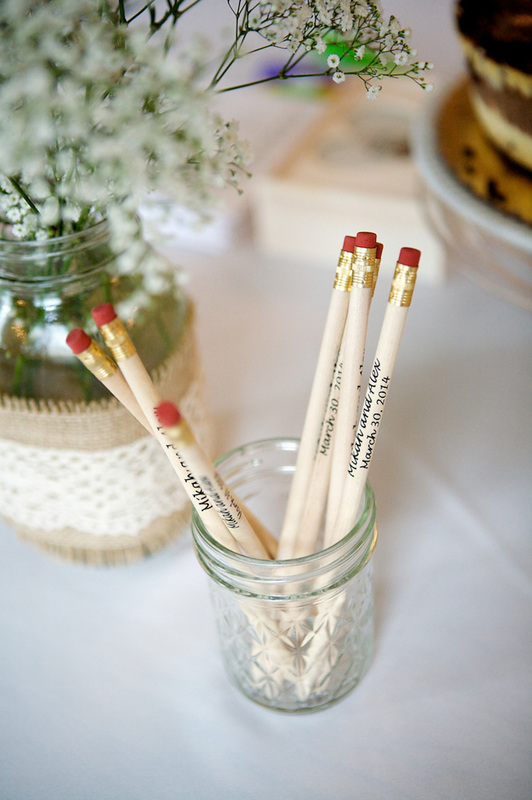 If you remember all that, and keep things in perspective, wedding planning will go smoothly. Also, don’t forget to have fun! And Pinterest should be your best friend (aside from your spouse, of course). Wonderful, wonderful images. 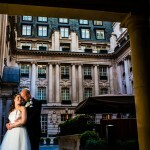 Such an amazing day and you blogged it with vibrancy and care. Really lovely. Beautiful wedding. So sweet! Lovely couple. 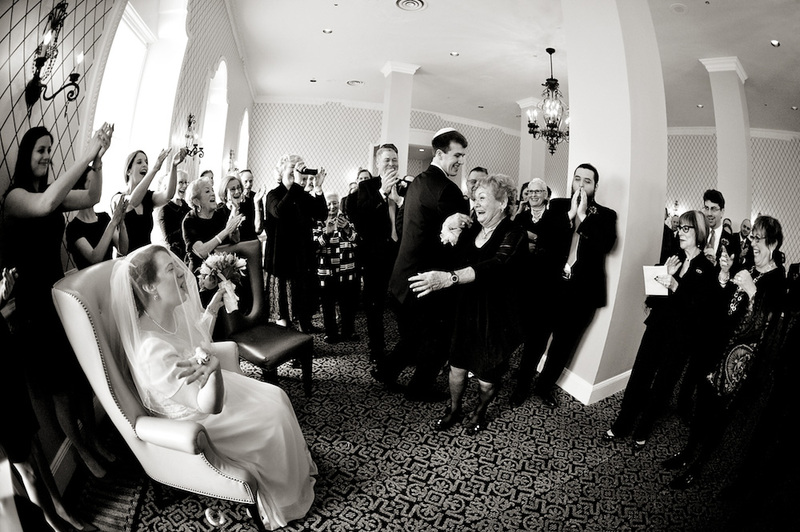 Love the bride’s expressions, they both look so happy! Having been guests at Mikah’s and Alex’s wedding, it was wonderful to re-live the day through Mikah’s storytelling and the beautiful pictures. It was truly just as she describes it – fun, delicious, and uniquely personal. We loved the rabbi’s advice! Fabulous isn’t it! 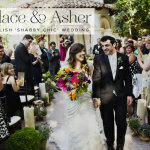 Thrilled you liked the blog… and there are tons more wonderfully inspiring Jewish weddings to ogle over too! Love it. Those shoes are just so fun! So many cute ideas! Love it.